Kids love bikes, it’s a fun way to get out and about, learn balance and co-ordination and show your mates what a pro you are on the bike. Our specially-designed skills course and tuition are based upon that recommended by the British Cycling's Go Ride Scheme and Cycling Ireland's Gearing Up kids programme. The days are aimed at providing a safe, controlled, fun environment to introduce youngsters to the sport of mountain biking. As with the adult sessions the children will learn basic skills of mountain biking but with the added advantage of a series of specifically laid out skills. 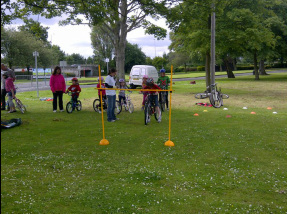 As from 2012 we now offer Cycling Ireland's Gearing Up Off Road programme. Gearing Up Off-Road deals with the specific fundamental skills required for cycling in an off-road environment and is based around progressive skills sessions run over 8-12 weeks. Contact us for details of sessions or how we can integrate Gearing up into your school, youth or clubs sporting activities! Sessions time are varied and are held at the following venues: Belfast & Craigavon. Just go to our Events Calender to check out where our next open Youth MTB day is and BOOK NOW.